Ninety percent — or 334 of 370 — of U.S. counties with a population of at least 100,000 are more affordable than historical averages, according to findings by RealtyTrac and Down Payment Resource. 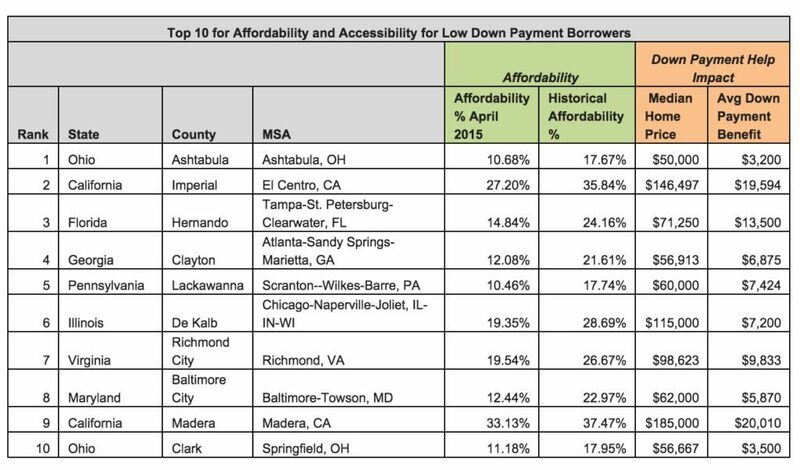 The two firms examined affordability, median income, median home price and homeownership program availability to determine the top markets for low down payment buyers. Other top counties are located in Chicago; Richmond, Virginia; Baltimore; and California’s Central Valley (Madera). Of the top affordable counties, seven of nine feature a median home price below $100,000. Of the top nine least affordable counties, three help to comprise the Atlanta metro region. In addition to Forsyth, Cherokee and Fayette counties are all cited as unaffordable, ranking at sixth and ninth. 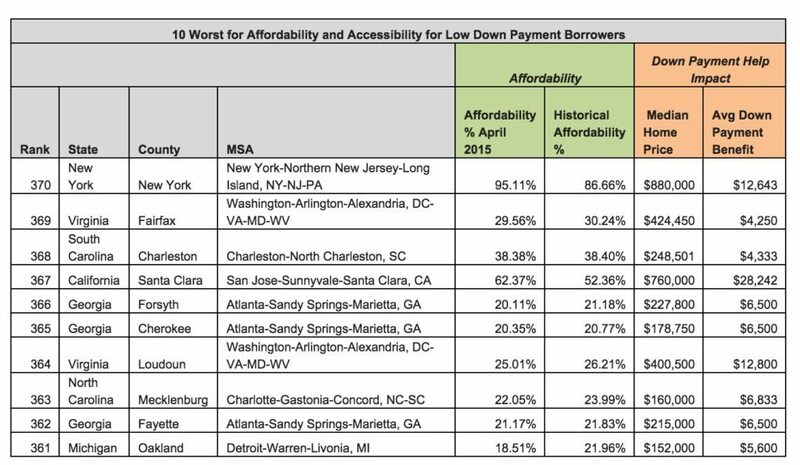 Five of the top 10 least affordable markets obtained the ranking despite sporting a median home price below $250,000. Three of the markets have median prices under $200,000. Counties least affordable relative to their historic averages were San Francisco and San Mateo counties in the San Francisco Bay Area. Kings County (Brooklyn, New York), Santa Clara County (California, in the San Jose metro area) and Denver County, Colorado, were next on the list. It’s no surprise these markets have been cited by housing information sources as the best for price appreciation. On average, across all 370 counties analyzed the average amount of down payment assistance was $10,443, which accounted for roughly 6.84 percent of a median home’s sales price. New study: The average down payment assistance amount was $10,443. According to a new CreditCards.com report, affordability is also on the minds of various individuals, as 27 percent of Americans say they’re losing sleep over their ability to pay the monthly mortgage/rent.